CLOVIS – This is the last weekend to visit the St. Jude Dream Home house. The house is open this Saturday from 9 a.m. to 5 p.m. and Sunday from noon to 5 p.m. Just for touring the home, visitors can enter for a free chance to win a $10,000 shopping spree at Ashley Furniture HomeStore. Tickets are going fast and only 10,500 are being sold, so Central Valley residents are encouraged to get theirs before they sell out. This De Young Energysmart approx. 3,300 square foot home is located in the CountryCourt community in Clovis. The home will be raffled off to benefit St. Jude Children’s Research Hospital live on KMPH FOX 26 next Sunday, Nov. 10 at 5 p.m.
“We strongly believe in our responsibility to help others, and our entire De Young team is grateful to our community’s continued support of our business so we are honored to be a donor and builder of our seventh St. Jude Dream Home,” said Paula De Young of De Young Properties, which is the home’s major donor and builder. Other prizes include a custom dream cake from Maddie Cakes Cupcake Bakery, a luxury suite at a 2014 Fresno Grizzlies Game, dinner under the stars, courtesy of Milla Vineyards, as well as many other prizes! For a complete list of prizes, visit www.dreamhome.org. Tickets can be reserved at all Fresno County Federal Credit Union branches, Fresno Coin Gallery locations and De Young Model Home Centers or by calling 1-800-543-5887. 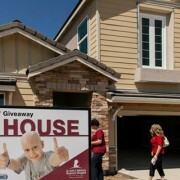 For more information about the St. Jude Dream Home Giveaway, visit www.dreamhome.org. Other sponsors of the fundraising campaign include De Young Properties, KMPH FOX 26, 106.7 KJUG, Univision Radio, The Fresno Bee, Business Street Online, Ashley Furniture HomeStore, Fresno County Federal Credit Union, Fresno Coin Gallery, Alpha Delta Kappa, Epsilon Sigma Alpha and national sponsors Shaw Floors and Brizo.